Tutubi provides at least a one week paid vacation per year with airfare or ferry fare to his loyal helper from Malabuyoc, Cebu. Usually she takes the flight via ZestAir or Cebu Pacific but due to her excess baggage woes, she prefers the slow ferry to Cebu. 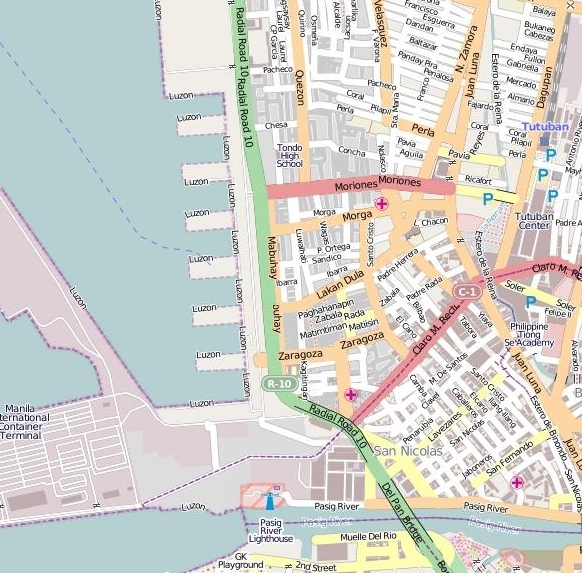 for a map of Manila North Harbor's Piers, please click here. Here's a location map of the North Pier with Pier 2 and Pier 4 at the bottom (south) and Pier 16 at the top (north). From Caloocan, Quezon City, and Pasay: best to take the LRT and get off at Carriedo Station, transfer to a Pier-bound jeep on Rizal Avenue (Avenida). Alight at Anda Circle (the rotonda just outside Intramuros). Walk towards the Shell gas station then board a North Harbor-bound jeepney. best to get off at MRT Taft Avenue Station, transfer to LRT via the footbridge get off at Carriedo Station. transfer to a Pier-bound jeep on Rizal Avenue (Avenida). Alight at Anda Circle (the rotonda just outside Intramuros). Walk towards the Shell gas station then board a North Harbor-bound jeepney. From Navotas, Malabon, there may be jeepney routes passing by North Pier but is unconfirmed so Tutubi defers posting information so as not to mislead commuters. There are also jeepneys plying the route Quiapo - Divisoria - North Harbor that Tutubi sees regularly along P Paterno near corner Quezon Boulevard but the exact route is not known to him if they traverse the whole stretch of C.M. Recto Avenue even inside traffic-prone Divisoria (which they obviously don't) but that jeepney route do indicate going to to Pier of North Harbor Manila. From Makati, the easiest route to North Pier is via Buendia (Sen. Gil Puyat Avenue), right to Roxas Blvd all the way to Intramuros, go around Anda Circle, cross Delpan Bridge then turn left to Moriones where the North Port of Manila gate is located. my taxi from TM Kalaw to North Port Passenger Terminal costs P90 on friday noon traffic. Its more expensive when you arrive just like in airport.